I have a Dolphin Diagnotic 2001 with a rev09 circuit board. The component to the right of the red wire is burnt. Can anybody identify the component and value? Any other info would be welcome. I also thought it looked like 18 Ohms in the photo but I could not find that value. I will probably go with 10 Ohms and see what happens. I am a bit concerned that, if it is being used as a current sensor, the reason for the burnout may be another component which is short circuit and as it is extremely difficult to monitor the current once it is all reassembled, there won't be much chance of saving things once it is powered up. Might as well chance it thogh as its not much use as it is. It may be a couple of weeks before I get a chance to sort it out but I will report on how I get on. It would appear from the photo that the resistor is either 10 or 18 Ohms and it will be 1 Watt. I would like a second opinion on the value though. No, unfortunately I have not been able to determine the value of the resistor. If I find the value I will contact you and let you know. If you could do the same for me I would appreciate it. I have searched the site and found much usefull information, but not unfortunately the information I am looking for. 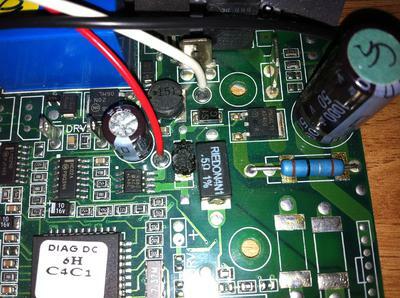 Search this site for Dolphin circuit boards. There is lots of information provided by an electrical engineer who attempted repair.